Here, try this — open your phone with one hand and see how long you can go before touching it with a second hand. That didn’t take long, did it? Swiping is not an issue, but opening multiple apps, tapping various places on the screen, and getting around is tough. Chances are good that you’ve seen a Popsocket, or something similar, on the back of a few phones. The simple design shifts the weight away from the front of your phone to the back, letting you use your thumb without strain. 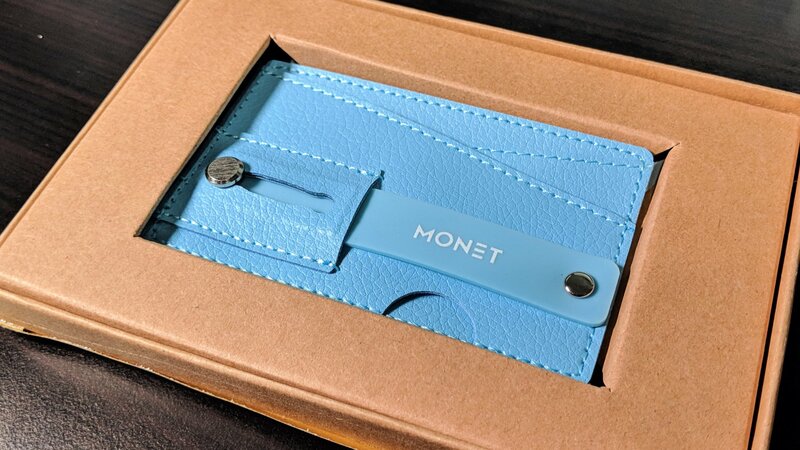 If you’re interested in checking out a solution to unwieldy and cumbersome phones, we’d recommend looking at Monet. We’ve had the opportunity to review a few of its options and are only too happy to share our findings. 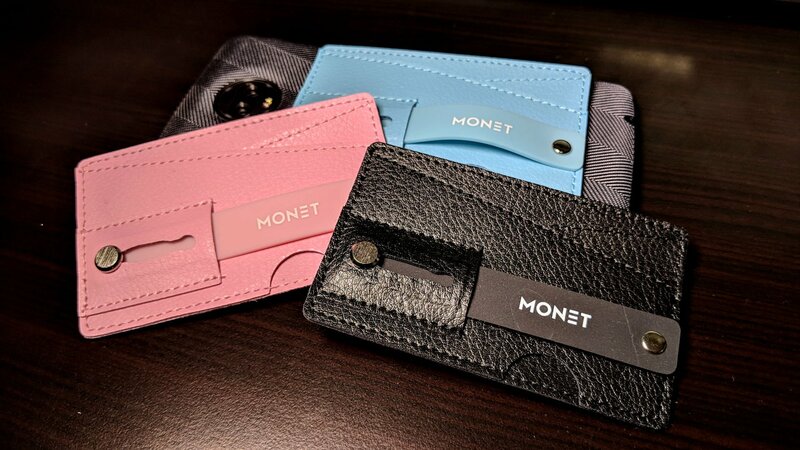 We were sent three versions of the Monet: Black Night, Light Blue, and Pretty in Pink (Light Pink). Save for their colors, each is designed the same way. 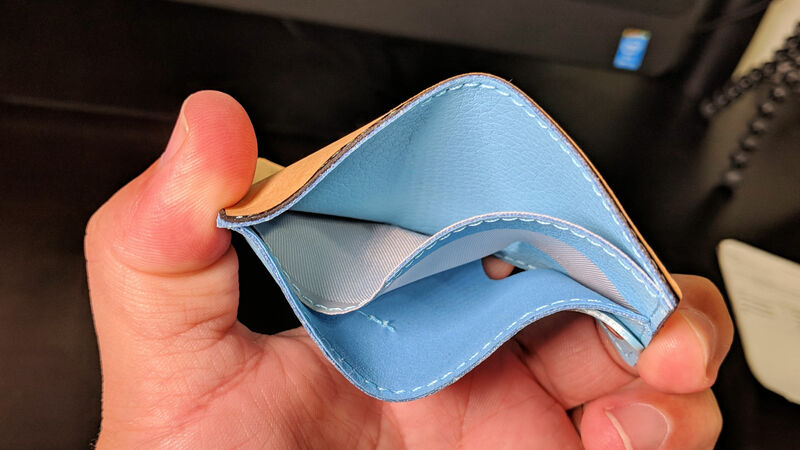 The thin accessory is equal parts phone grip, wallet, and kickstand. To apply the Monet all you need to do is peel off the backing and stick it to your phone. You’ll want to ensure that you’ve got room before doing so as some models may not be big enough to support the Monet. A quick sizing against a few models here at the office found that fingerprint sensors would sometimes be covered up. 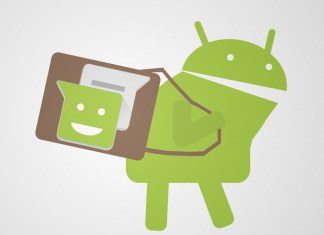 If you’d like to gauge whether one might work for you, place a credit card on the back of your handset. Give yourself a bit of breathing room but not much. 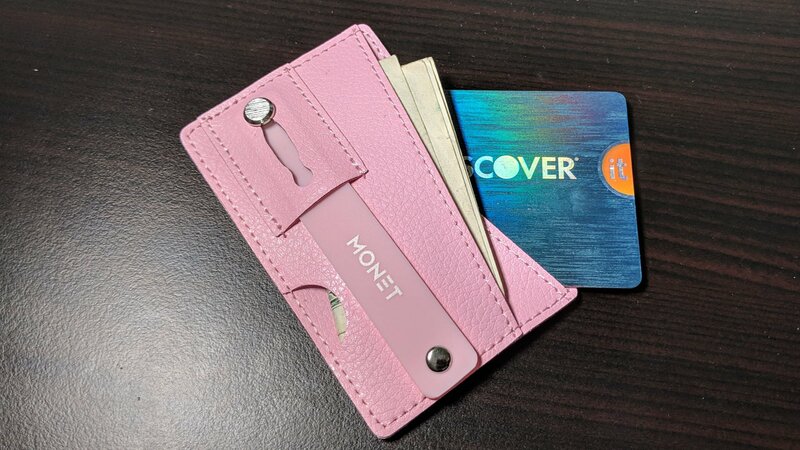 The Monet is built to hold a couple of your cards or cash with little wasted space. With two tight pockets to work with you can carry your main card, a business card or two, and a tiny bit of cash. There’s not a lot of play in the pockets, but that’s a good thing as you don’t want to lose those important items while out and about. We like the peace of mind we get in leaving the wallet or purse home for date night or a business lunch. There’s no real reason to lug around the extra stuff that’s not going to be used over the next few hours. The Monet solves a problem we didn’t realize we had. The adjustable loop fits your finger nicely, making it easy to hold onto the phone for swiping. It doesn’t help you reach opposite edges or corners, but things definitely feel more natural to hold in one hand. When not in use, simply slide the loop snug to the back and it will essentially lock into place. Using the loop you can also set your phone on its side as it serves as kickstand. This is great for watching video on the plane, landscape selfies in the middle of class, or innumerable other reasons. As much as we’re a fan of the Monet, there are a couple of things we should point out. If you have wireless charging on your phone, and do use it, this is not the accessory for you. Then again, neither is a Popsocket. You won’t have the ability to place your phone flat on a wireless platter. Additionally, you can’t set your phone down flat at all. If you’re the type who likes to place their handset face up on a table or surface, you’ll end up with a wonky angle or some movement. 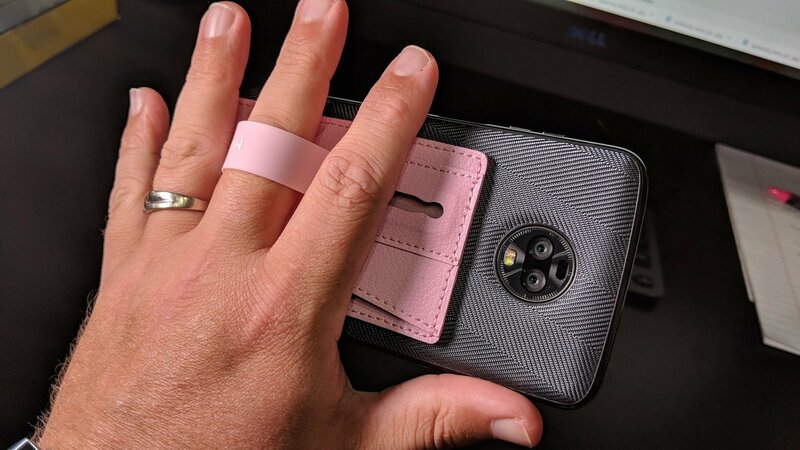 A lot of users protect their device with a phone case. To that end, nearly everyone you buy today provides a bit of a lip around the edge. Once you realize this, and take advantage of it, you’ll find that you’re no longer leaving the display exposed. 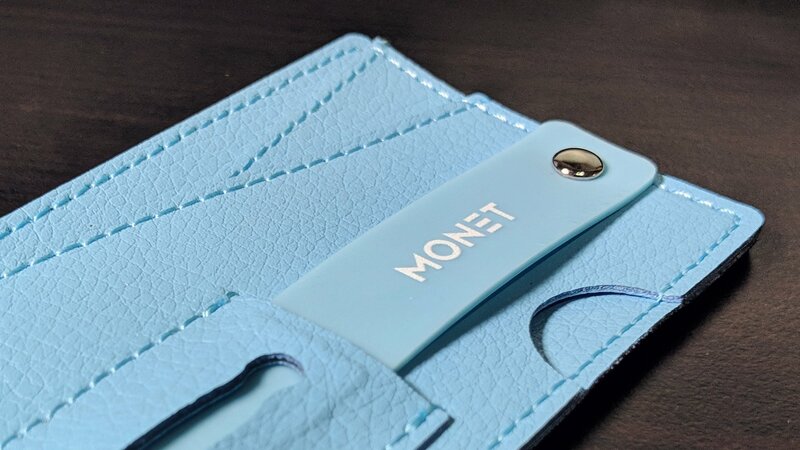 We stuck the Monet onto the back of a textured phone case and found it stays in place nicely. It works just the same as it would on the rear of a glass or plastic device and we’ve yet to see any signs of the adhesive giving up. As we were putting this review together we found the Monet serves another purpose, albeit a completely different one. 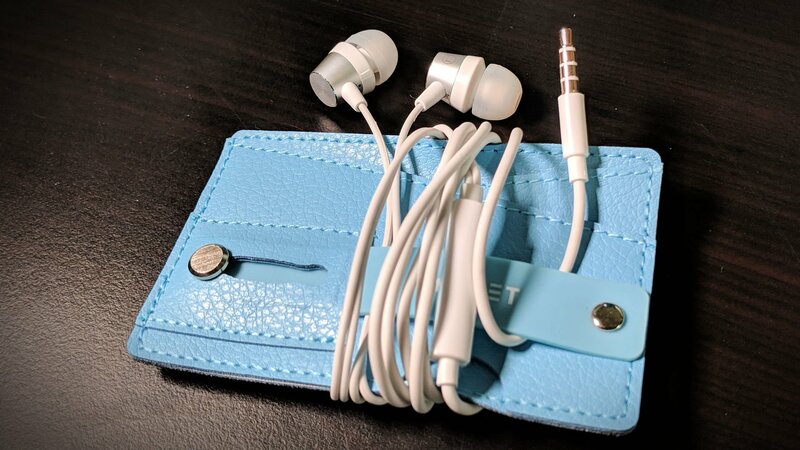 Using it as a thin wallet, we wrapped corded headphones around and tucked the ends in the loop. Forgoing a phone altogether we could see this being a fashionable and functional way to carry a few essentials to school or work. 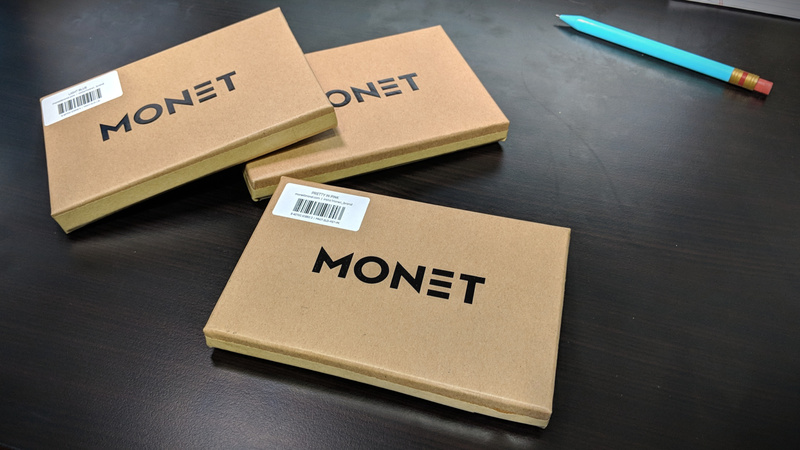 The Monet runs $20 through its website and Amazon. As of today we see there’s a $5 off coupon if you apply MONET5 at checkout through the official site. Enjoy free shipping on all orders, too. With a variety of color options to choose from, there’s something for everyone. Selections include solids, neons, patterns, multi-color, and pastels. We’ve already enjoyed our time with the Monet and think you would, too. Editor Note: We received the three review units at no cost to our outlet. All opinions are 100% ours and were in no way affected by the complimentary accessories.